I’ve already confessed my weird hobby of taking on remodeling projects whenever my husband leaves town. Today, I’m sharing another one of my (somewhat strange) infatuations: my plant wall. 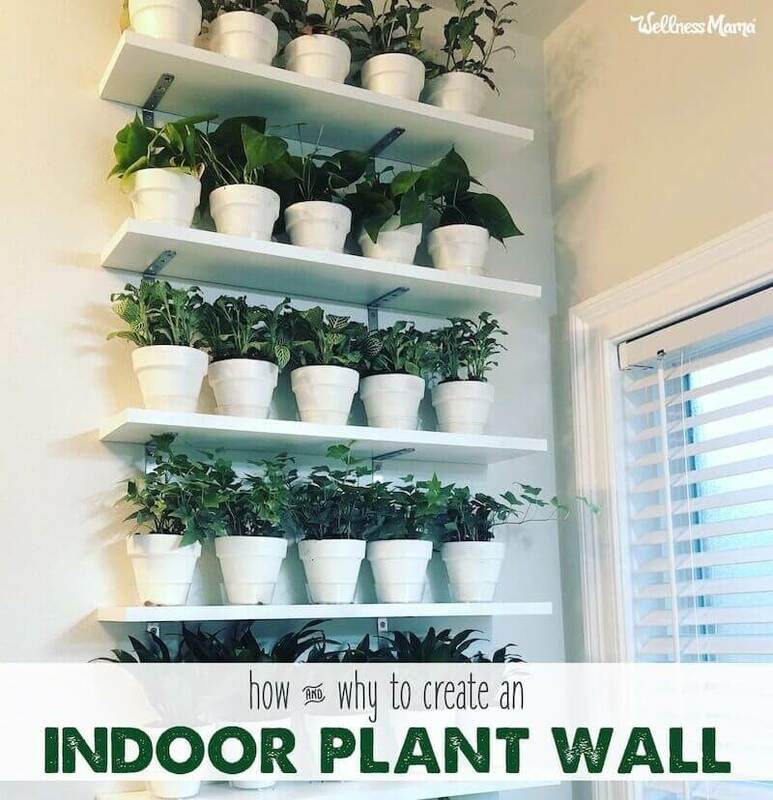 Or should I say plant walls, since I’ve created several of them throughout my house. Well, for starters, plant walls are beautiful and incredibly versatile. They make it easy to add plants, even in small spaces and are a great mixture of art and function. Plants are also an asset to indoor air quality. The NASA Clean Air Study revealed that certain plants can help reduce chemicals in indoor air. NASA uses this strategy in the space station and other studies suggest that plants may be able to clean indoor air as effectively as air filters. The Clean Air Study recommended at least 1 plant per 100 square feet of space for best results. Sounds like the perfect justification to indulge my indoor plant addiction! Now for the fun part! The sky is the limit when it comes to designing a wall you’ll love for your own home. Any plants can work but for easy care, choose ones that can handle low to medium light and that don’t need to be watered too often. Or, even consider an edible plant wall or herbs in your kitchen to make it super useful! I personally have a mixture of ferns, pothos, palms and English ivy on a wall in my bathroom. I also have a mixture of ferns and pothos in my home office. Whatever you want to use, pick some plants you love and a way to display them. Use an old bookshelf and repurpose near a window to hold plants instead of books. Get some sturdy floating shelves and some pretty planters for a wall mounted plant wall. Build some wall shelves out of lumber scraps and mount with inexpensive brackets. Hang a series of hanging pots in a window for a window plant wall. Use a pre-made plant wall holder (make sure to use a waterproof backing if hanging indoors!). Make some pipe shelves and use them to your planters. Get some self-watering pots and mount them to a board for an easy wall. I built this one above my tub in my bathroom near a window that gets a lot of sun. Paint the scrap wood and the clay pots with the non-toxic paint for a uniform look. Mount the shelves to studs using a stud finder. Filled each pot with my homemade potting soil and a small plant. After finishing the wall in my bathroom I decided I needed a smaller version in my office. (I told you it was becoming an obsession.) This one would be in the backdrop of any videos I record and my podcasts, so I wanted to create a unique look. This project really is as simple as finding studs for the brackets and potting the plants. For this one, I picked variations of ferns and some trailing pothos for a mixed look. Ready to start plant shopping? Here’s a visual introduction to the most popular houseplants to get you started! Will you build an indoor plant wall? Have you already? Share below!